HOT PEPPER® Furnace is committed to respecting the important personal privacy of individuals who visit our Website (www.HotPepperFurnace.com, the Website). 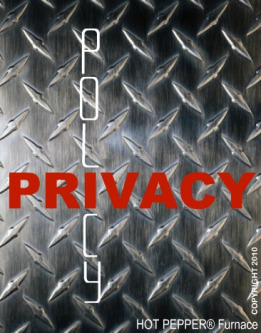 HOT PEPPER® Furnace has created this privacy statement in order to demonstrate our solid commitment to applicable privacy laws governing the Province of Alberta. Our Website contains links to other sites. Please be aware that HOT PEPPER® Furnace is not responsible for the privacy practices of other sites. We encourage our Website visitors to be aware when they leave our site and to read the privacy statements of each and every website that collects personal information. This privacy statement applies solely to information collected by our Website. HOT PEPPER® Furnace uses internal analytics tools to analyze statistical data of traffic to our Website. These analytic tools do not create individual profiles for visitors but rather only collect general statistical data. Our Website contains various contact forms where it is required to provide appropriate personal information in order to successfully facilitate the requests. All participation in filling out the applicable contact forms is completely optional. HOT PEPPER® Furnace does not sell, re-sell, rent or otherwise make available any of that personal information voluntarily provided by the Website visitor and/or Website user. Should you have any concerns for privacy issues, please email directly at info@hotpepperfurnace.com .